Description of "Who Are You? 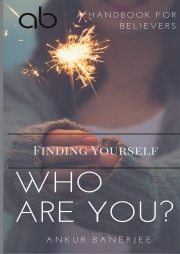 - Finding Yourself"
This book is compilation of scientific studies and expert opinion addressing practical methods and current theories in Finding Yourself. The professional reader will find illuminating case histories, pure psychobabble conjecture, alternative viewpoints, dreamy reminisces, cheap-shot journalistic reporting and some things that just popped up and sounded halfway reasonable. The casual reader won’t give this a second glance. The aim of this book is to supply readers with practical examples and helpful hints as to how to spot, understand, and instill a real sense of self in your innermost being. This book’s contents should guide readers to a more practical self-knowledge, peace of mind, spiritual nurturing, fuzzy thinking, and strange longings you really should just keep to yourself. Reviews of "Who Are You? - Finding Yourself"